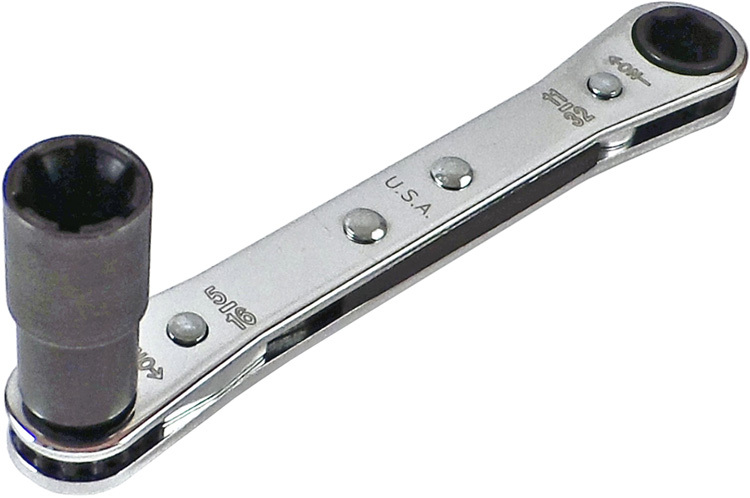 1/4'' Six-Wing® collar removal tool with ratchet and drive socket, straight handle, extended socket. When fitted into the flat box-ratchet handle, these sockets provide easy removal, while at the same time preventing re-installation or re-use of the removed collars. New collars must be used to insure proper torque. The Six-Wing® frangible collar is recognizable by the six-faceted, semi-spline arrangement of wings around the collar base. These collars are used in high strength applications, typically on fighter aircraft. Special tapered spline sockets were developed to remove these collars.